A new federal report looks at climate change from a public health perspective, focusing on things such as vector-borne diseases like plague and West Nile virus, and how everything from heat waves and poor air quality will affect people’s health and even food safety, nutrition, and distribution. Every American is vulnerable to the health impacts associated with climate change. 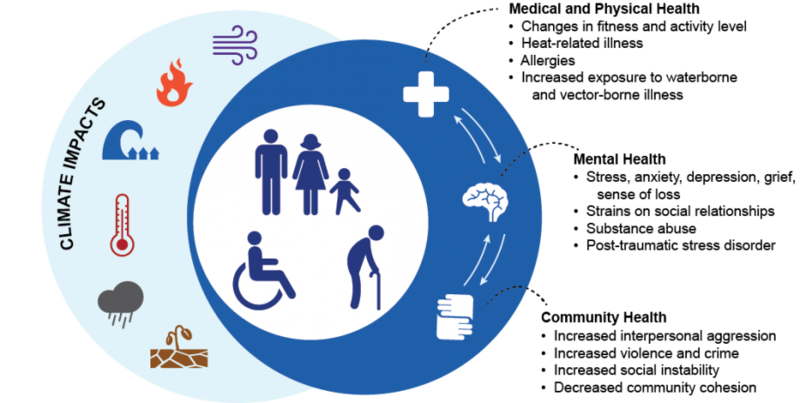 Increased exposure to multiple health threats, together with changes in sensitivity and the ability to adapt to those threats, increases a person’s vulnerability to climate-related health effects. The impacts of climate change on human health interact with underlying health, demographic, and socioeconomic factors. Climate change, write the authors, creates new public health challenges and exacerbates some existing ones. And some populations are “disproportionately vulnerable,” including: low-income communities, some communities of color, immigrant groups, Indigenous peoples, children and pregnant women, older adults, vulnerable occupational groups, people with disabilities, and those with preexisting or chronic medical conditions. The report’s authors also look at how the consequences of climate change can affect mental health. Studies also show that people who experience life-threatening climate-related events, such as Hurricane Katrina, can suffer from acute stress, PTSD, and higher rates of depression and suicide. Drought-related worry and psychological distress increased in drought-declared Australian regions, particularly for those experiencing loss of livelihood and industry. Long-term drought has been linked to increased incidence of suicide among male farmers in Australia. Chronic stress from the acute and ongoing impacts of climate change may alter biological stress response systems and make growing children more at risk for developing mental health conditions later in life, such as anxiety, depression, and other clinically diagnosable disorders. Patrick Dearen’s new book, Bitter Waters: The Struggles of the Pecos River, offers a good reminder of how complex New Mexico’s relationship is with water, its rivers, and its downstream neighbor.